With over 82 million inhabitants, Germany is the most populous country in the European Union. However, its fertility rate of 1.39 children per mother is one of the lowest in the world, and the federal statistical office estimates the population will shrink to between 69 and 74 million by 2050 (69 million assuming a net migration of +100,000 per year; 74 million assuming a net migration of +200,000 per year). Germany has a number of larger cities. The most populous cities are: Berlin, Hamburg, Munich, Cologne, Frankfurt, and Stuttgart. By far the largest conurbation is the Rhine-Ruhr region, including Düsseldorf, Cologne, Essen, Dortmund, Duisburg, and Bochum. Ethnic Groups in Germany: Germans 91.5%, Turks 2.4%, others 6.1% (made up largely of Greeks, Italians, Poles, Russians, Serbs and Croatians). German language taught in schools and used in the media is often not the same as German spoken in the streets. Various dialects have a strong influence in most areas. English is widely understood and many Germans from the former East Germany speak Russian. Age Structure is the distribution of the population according to age. The age structure of a population influences key socioeconomic issues. Countries with young populations (high percentage under age 15) need to invest more in schools, while countries with older populations (high percentage aged 65 and over) need to invest more in the health sector. German population is a rapidly ageing, with high percentage of people aged 65 and over. GDP structure: 68,4% services, 30,4% industry, 1,2% agriculture. Employment structure: 63,8% of German employees work in services, 33,4% work in industry and 2,8% work in agriculture. The biggest problem for Germany is the economic and social difference between the western and eastern Germany. The differences between the west German states of the former Federal Republic of Germany and the east German states of the former German Democratic Republic, are substantial and difficult to manage. For instance, the per capita GDP (gross domestic product) of the western region is high, while the per capita GDP of the eastern region is extremely low. The highest GDP is in the area of Oberbayern in the west, and the lowest GDP is in the Dessau region of eastern Germany. Similar problem stem from the difference in socio-economic measures such as rate of unemployment. In the western part of Germany the unemployment rate is about 10% , while in the eastern part of Germany it is about 19% of the workforce. The regions with highest unemployment are Berlin 18,9%, Leipzig 19,3%, Dessau 22,9% and Halle 23,4%. The lowest unemployment is the region of Oberbayern 4,9% in the federal republic of Bavaria. These differences cause social frictions between inhabitants of the western and the eastern parts of Germany and cause problems for the German Government. In the middle ages, Germany was not united. The Holy Roman Empire was often just a concept without real power. There were a number of individual states in the territory of the Empire. The medieval rulers over Germany include: the King of Bohemia-Charles the IV, Archbishop of Cologne, Archbishop of Mainz, Archbishop of Trier, Count Palatine of the Rhine, Duke of Saxony, Margrave of Brandenburg . 1919–1933 - Weimar Republic was a week state, with unhealthy economy, high inflation and high unemployment. 1933-1945 – Hitler’s Period – „The Third German Empire"
1938-1939 ¬– Hitler’s armies occupied Austria and later Czechoslovakia. 1949 – two German states were created by the winners of the Second World War – The Federal Republic of Germany (from USA, British and French Sectors) with capital city of Bonn, and The German Democratic Republic (Soviet sector). The former capital of Germany - Berlin was divided into West Berlin (free state) and East Berlin, the capital of the German Democratic Republic (DDR). Germany is a federal republic. The head of the Federal Republic of Germany is a president. 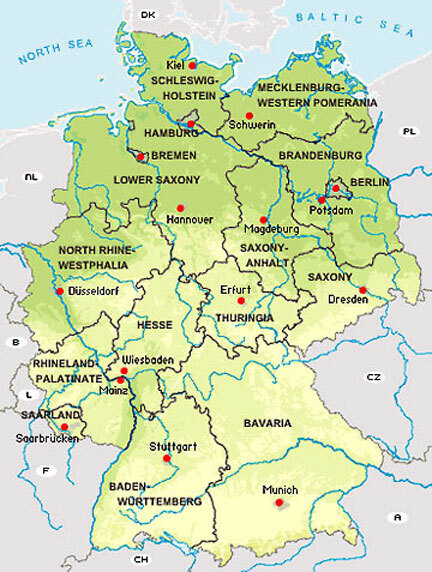 German Federation consists of 13 states and 3 free cities: Baden-Württemberg, Bayern, Brandeburg, Hessen, Mecklenburg-Vorpommern, Niedesachsen, Nordhein-Westfalen, Reinland-Pfalz, Saarland, Sachsen, Sachsen-Anhalt, Schleswig-Holstein, Th?ringen and the three cities are: Berlin, Hamburg and Bremen. In terms of "European regions", Germany has 41 regions (at NUTS2 level). It is a country wirth most European regions. For comparison: Great Britain has 37,France 26, Spain 19, Italy 21 etc. The capital of Germany is Berlin about 3 500 000 inhabitants, it´s after Moscow, London, Istanbul and Sant Peterburg the fifth large European city. Next largest German cities are: Hamburg 1 700 000, Munchen 1 300 000, Koln am Rhein 1 000 000, Frankfurt 700 000 etc. Germany is a federal, parliamentary democracy. The German political system operates under a framework laid out in the 1949 constitution known as the Grundgesetz (Basic Law). By calling the document Grundgesetz, rather than Verfassung (constitution), the authors expressed the intention that it would be replaced by a proper constitution once Germany was reunited as one state. Amendments to the Grundgesetz generally require a two-thirds majority of both chambers of the parliament; the articles guaranteeing fundamental rights, the separation of powers, the federal structure, and the right to resist attempts to overthrow the constitution are valid in perpetuity and cannot be amended. Despite the initial intention, the Grundgesetz remained in effect after the German reunification in 1990, with only minor amendments. The Bundeskanzler (Federal Chancellor), currently Angela Merkel, is the head of government and exercises executive power, similar to the role of a Prime Minister in other parliamentary democracies. Federal legislative powers are vested in the parliament consisting of the Bundestag (Federal Diet) and Bundesrat (Federal Council), which together form a unique type of legislative body. The Bundestag is elected through direct elections, yet abiding proportional representation. The members of the Bundesrat represent the governments of the sixteen federal states and are members of the state cabinets. The respective state governments have the right to appoint and remove their envoys at any time. Since 1949, the party system has been dominated by the Christian Democratic Union and the Social Democratic Party of Germany although smaller parties, such as the liberal Free Democratic Party (which has had members in the Bundestag since 1949) and the Alliance ’90/The Greens (which has controlled seats in parliament since 1983) have also played important roles. The German head of state is the Bundespräsident (President), elected by the Bundesversammlung (federal convention), an institution consisting of the members of the Bundestag and an equal number of state delegates. The second highest official in the German order of precedence is the Bundestagspräsident (President of the Bundestag), who is elected by the Bundestag and responsible for overseeing the daily sessions of the body. The third-highest official and the head of government is the Chancellor, who is nominated by the Bundespräsident after being elected by the Bundestag. The Chancellor can be removed by a constructive motion of no confidence by the Bundestag, where constructive implies that the Bundestag simultaneously elects a successor. Cultural Attributes: Germans have a reputation for being industrious, thrifty, and orderly. They have a strong sense of regional pride, a fact that the federal system of government recognizes and accommodates. Most Germans have a strong classical education because of the nation’s rich heritage in music, history and art and they expect others to appreciat that heritage. Germany is one of the most densely populated countries in Europe with number of inhabitants 82 544 000 (40 340 000 men and 42 100 000 women). Germany is the thirteenth most populous country in the world. The most inhabitants live in the federal republic of Bavaria (12 500 000). Density population is about 231 inhabitants per km2. Ethnic composition of Germany is as follows: German – 92%, Turks about 3% with 2 million inhabitants, Italians 600 000 inhabitants, Greeks 350 000 inhabitants and Poles 330 000 inhabitants. The most foreigners lives in the European regions of Hamburg 14,2 %. Hamburg has about 1 750 000 inhabitants of whom about 250 000 are foreigners. The most foreigners live in Nordhein-Westfalen about 2 million foreigners, and in Stuttgart about 560 000 foreigners. In terms of religious denomination, most Germans are protestant - 47%, catholic 38%, Muslim 3,9% and Jewish 0,2%. German high culture represents the traditional heritage of Germany in the field of literature, music, arts, cinematography, sports, cuisines etc. In the field of literature the country has shown marked progress during middle ages. At this time some of the master-writing received huge appraisal for their style and mass appeal. These comprise fairy tales collections by Jacob and Wilhelm Grimm. This was the time when bible was also translated to German, and the language used in the translation was known as the High German language. In the genre of poetry and literature some of the eminent authors contributed most remarkably, they are Lessing, Goethe, Schiller, Kleist, Hoffmann, Brecht and Schmidt. The country has some renowned musical artist and world-famous composers, such as Beethoven and Bach. German cinematography dates a few years back. Under Hitler, most of the German cinematography served the imperial propaganda. From 1981 onwards Germany has produced variety of movies with respectful evaluation from the international film fraternity. In the recent past, the German film known as "The lives of others" by F.H. von Donnersmarck won an academy award for best foreign language film in 2007. In the filed of architecture, German architects are famous for centuries of good building design. During the Nazi period, the country went through an era of pompous imperial building design inspired by ancient Rome. But after the Second World War, Germany started to contribute in important modern and post-modern structures, particularly since the reunification of Berlin. German culture is strongly influenced by religion, particularly Catholic, Protestant and Jewish. It also reflects academic achievement. Some of the greatest universities in Europe are in Germany: for example: University of Tubingen, University of Berlin, University of Heidelberg , University of Marburg and others. German culture rewards forward thinking and planning - knowing what one will be doing at a specific time of the day. Careful planning, in one’s personal and business life, provides a sense of security. Rules and regulations allow people to know what is expected and can plan their lives accordingly. Once a proper way of performing a task was discovered, there is no need to think of doing it any other way. Germans believe that maintaining clear lines of demarcation between people, places, and things is the surest way to lead a structured and ordered life. Work and personal lives are carefully separated. There is a proper time for every activity. When the business day ends, you are expected to leave the office. If you must remain after normal closing time, it indicates that you did not plan your day properly. Germans do not need personal relationships in order to do business. They will be interested in your academic credentials and the length of time your company has been in business. Germans display great deference to people in authority, so it is imperative that they understand your level of authority relative to their own. Germans do not have an open-door policy. People often work with their office door closed. Knock and wait to be invited in before entering. Following the established protocol is critical to building and maintaining business relationships. As a group, Germans are suspicious of hyperbole, promises that sound too good to be true, or displays of emotion. Germans will be blunt and will go directly to the point of business. Expect a great deal of written communication, both to back up decisions and to maintain a record of decisions and discussions. Germany is heavily regulated and extremely bureaucratic. Germans prefer to get down to business and only engage in the briefest of small talk. They will be interested in your credentials. Appointments are mandatory and should be made 1 to 2 weeks in advance. Punctuality is taken extremely seriously. If you expect to be delayed, telephone immediately and offer an explanation. It is extremely rude to cancel a meeting at the last minute and it could jeopardize your business relationship. Initial meetings are used to get to know each other. They allow your German colleagues to determine if you are trustworthy. Meetings adhere to strict agendas, including starting and ending times. You must be patient and not appear ruffled by the strict adherence to protocol. Germans are detail-oriented and want to understand every innuendo before coming to an agreement. Business is hierarchical. Decision-making is held at the top of the company. Avoid confrontational behavior or high- pressure tactics. It can be counterproductive. Germany is a one of the most visited countries in the world. In the year 2007, Germany was visited by about 25 million foreigners. Most foreigners visited European region of Oberbayern, about 5 million people in 2007. Wherever you go in Germany, there is something interesting to see or do. It is a goldmine for the adventurous tourist in search of something different. The country has now firmly shaken off the shadows of its 20th century past, regained a sense of national pride, and breathed a sigh of relief at its new-found ability to express its distinctive national character again. Modern Germany has come of age, and while it is still suffering the economic consequences of reunification in October 1990, Europe’s most populous country is clearly a nation coming to terms with itself. Massive investment in the long-neglected infrastructure of the former East is paying of, as cities like Dresden once again begin to shine like the jewels they were in the past. The country is the product of a long history of division, first as a loose collection of independent (and often warring) states before original unification during the 19th century, and lately of west and communist east following the Second World War. It is a country of remarkable diversity, with cultural differences clearly evident as one travels around the various states that make up the modern federal republic. Germany boasts a heady mix of history and nature, fine arts and youthful rebellion. Its capital, Berlin, has a reputation gained from its decades as a divided city, as a hedonistic, ’on the edge’ community where almost anything goes. In contrast, the quiet academic surroundings of historic university cities like Heidelberg, convey a peacefulness, quite at odds with the atmosphere of the capital.